Racial identity is an exceptionally personal distinction for each person of color. Too many of us struggle with owning who we are and what that means to the rest of the world. A lot of times, we're told that we don't look, talk, dress, or behave in a way that truly represents our identity. Our heritage and ancestry are questioned because we don't fit the stereotype of what others want us to be. We are seen as a monolith and our lives are inspected as a collective whole. The erasure of our identities is something that has a deep and negative impact on us. As a woman from Pakistan with Indian heritage, I know who I am. Or, I think I do. There are parts of me that even I struggle with accepting and reclaiming. These parts are my indigenous roots. I refused to acknowledge that I was also indigenous, rationalizing it because I was not born and raised in the culture. I felt it insincere to claim a part of my ancestry that I did not experience firsthand. I am reclaiming it now. My grandmother is from the Katkari tribe in India. Her home and way of life was in the forests of Maharashtra, India. I may not have lived there, but I have had their values, traditions, culture, and strength instilled in me by her. I grew up with the stories of her life and her people. She made sure that I did not forget that part of myself. Just remembering that legacy and being able to carry on the knowledge means the world to her. When people tell me that I have no real connection to the Indigenous community, I ask them "why do you think that is?" They never have an answer. The reality is that the Katkari people living in the forests were driven out of their land. All of their resources and food supplies were stolen. The trees were cut down, the land was taken for commercialization, and the animals they hunted and fished were taken as well. They had no other options but to leave. They lost their homes and way of living due to modernization, colonialism, and anti-indigenious discrimination. How could I possibly have a concrete link to that culture when my grandmother had to leave her beloved home just to survive? The only connections that even she had left were memories, nostalgia, stories, cultural practices, and customs. She made a conscious effort to pass all of those down to me as best as she could. I'm done with pushing down an integral part of who I am to appease the very people who think less of me for it. I am reclaiming my heritage. I am proud of my ancestors. 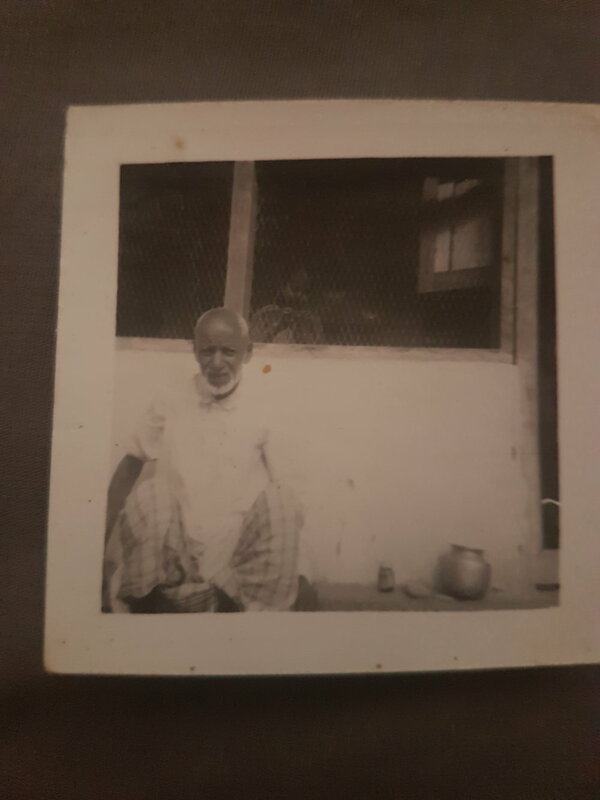 My great-grandfather sitting while my grandmother looks on from behind the screen. This was taken just after they fled their homelands.